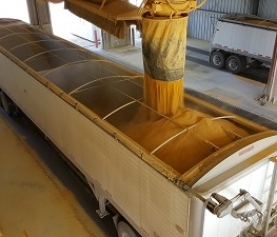 In an effort to give our shareholders insight into how ethanol is made at Homeland we are putting together a four part series describing the process. The focus of Part 1 was Corn, Grain Receiving, Grain Storage, and Grain Cleaning/Milling. The focus of Part 2 was Slurry, Liquefaction, and Fermentation. Part 3 will focus on how we take the alcohol that is produced in the Fermenters and produce fuel grade ethanol. As discussed in Part 2, Fermentation is a batch process and once a batch is complete, which takes just over two days, the 780,000 gallons of 16% ethanol by volume which we call “Beer”, is transferred forward to a surge tank. This surge tank is called the Beer Well and allows us to operate the batch Fermentation process and the continuous Distillation process without interruption. Approximately every 7-1/2 hours a Fermenter is transferred or “dropped” to the Beer Well while a continuous flow is sent forward to our distillation system. On the way to distillation, this stream is preheated to conserve energy and pH adjusted down with Sulfuric Acid to reduce fouling in the downstream equipment. Distillation requires steam produced at the plant to boil the ethanol (turn it into vapor) in order to purify it. Our distillation system consists of 3 Distillation Columns. The 16% ethanol Beer is sent to our first of three distillation columns called the Beer Column. The primary purpose of the Beer Column is to separate the ethanol from the water and solids in the beer stream. To make sure we vaporize and push all the ethanol out the top of the column we also vaporize some of the water and carry it with. The remaining water and solids exit the bottom of the beer column and will eventually be turned into DDGS. The DDGS process will be the focus of Part 4. The 50% ethanol, 50% water vapor (100 proof) that leaves the top of the column is sent over to the Rectifier Column for further purification. As a side note, to convert % ethanol to proof, simply multiply by 2 or double the % ethanol number. For example 50% ethanol is the same as saying 100 proof ethanol. In the Rectifier Column, the 50% ethanol vapor is further refined into 95% ethanol (190 proof), pulled out the top of the column, condensed (turned into a liquid) and stored or sent directly to the Mole Sieves. The stream coming out the bottom of the Rectifier is approximately 40% ethanol and is sent to our third distillation column, called the Side Stripper. 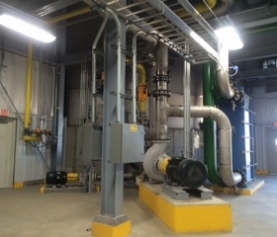 The purpose of the Side Stripper is to separate the ethanol from the water so the water can be recycled back to the front of the plant and the ethanol can be recovered. 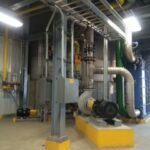 The water goes out the bottom of the column and the ethanol is concentrated up to approximately 50%, and sent out the top of the Side Stripper back to the Rectifier. 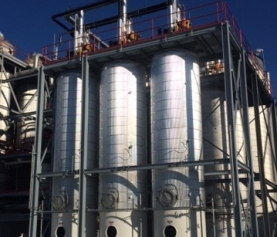 To summarize, inside the 3 Column Distillation system 16% ethanol Beer is separated into 3 streams: 190 proof ethanol, water to be recycled to the front of the plant, and a water/solids stream that will be eventually turned into DDGS. The liquid alcohol stream that leaves the Rectifier is sent to our Mole Sieves to be turned into 99% ethanol (198 proof) and 1% water. This liquid stream is vaporized and sent to one of 3 sets of Mole Sieves with each set containing 3 bottles. These bottles are filled with silicate beads about the size of a BB that are used to remove the remaining water. These beads act like Velcro towards the water grabbing on to it while allowing the ethanol to pass thru. One of the three bottles in a set is always being fed while the other two are regenerated (pulling the water back off and sent back to Distillation) and getting ready to be fed again. The ethanol stream exiting the bottles is then condensed and sent to final product storage. We just installed and started up our 3rd set of Sieves at the beginning of November which removed a significant bottleneck in our process and in turn increased our capacity in this part of the process by almost 50%. We add Denaturant to our ethanol in order to make it “Fuel Grade” and not fit for human consumption. This is a requirement of our alcohol production permit. The liquid alcohol stream that leaves the Mole Sieves is sent down to the tank farm, combined with Denaturant (liquid Natural Gasoline) and a Fuel Additive (corrosion inhibitor and pH buffer), before being stored in one of our three large 1.5 million gallon white storage tanks in our tank farm. We add Denaturant to our ethanol in order to make it “Fuel Grade” and not fit for human consumption. This is a requirement of our alcohol production permit. 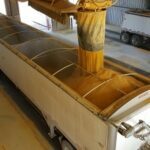 From one of the three storage tanks, the product is sampled, certified, and loaded out in either tank trucks or railcars. We have one truck loadout and three railcar loadouts. Our loadout system is sized so we can load a 9,000 gallon truck in approximately 15 minutes or up to (3) 29,000 gallon railcars at a time in just under 30 minutes. Approximately 98% of our ethanol leaves the plant via rail in 80 car unit trains heading to the Northeast part of the US. The vapors that are displaced from the railcar or tank truck during loading are captured and sent to an enclosed flare, where the permitted compounds are burned/destroyed prior to being released to the atmosphere. As we continued to debottleneck our plant and produce and loadout more and more gallons we also added a 3rd 1.5 million gallon storage tank and 3rd rail loadout as part of our 2015 Capital Plan.